Beautiful Lakefront Villa - 5 Minutes to the Attractions! Two master bedrooms with private bathrooms, one with one queen size bed and one with two queen beds and private bathroom, dinning room, fully equipped kitchen including electric range, oven, microwave oven, refrigerator, dishwasher, coffee maker, toaster, dishes, glasses, and pots. Washer & dryer. Two cable TV's. Central air conditioning and Wireless Internet. Living room, and terrace overlooking the lake Big Sand Lake, one of Florida's purest natural lakes you see in the picture and the breathtaking Sunset and Sunrise from the Villa's living room and patio. The complex is adjacent to the award-winning Smokehouse Bar & Grill, a restaurant known as the “home of Orlando's best BBQ," it offers a relaxed, moderately priced, casual dining experience for the entire family. Smokehouse Grill features a full-service bar, game room and 10 plasma screen TVs displaying continuous sporting events. The Villa is located in the upscale Dr. Phillips area of Orlando, right in the middle of the 3 main Theme Parks - Disney, Universal, and Sea World. The villa is Lake FRONT you can walk from the Patio to the Lake. Sunrise, Sunsets, Fireworks View from the villa. Grill Restaurant with Happy Hour and Specials-KIDS eat Free. Great location - close to parks. Great lake view. Very convenient location. Close to Wholefoods and Walmart as well as other shopping. Very close to theme parks. Quite neighborhood with friendly neighbors (I met a couple of them on morning walks). Beautiful lake for viewing and walking around. Met all our needs. Myrtle was great to deal with. The unit is on a great location, close to the attractions and convenient to stores, gift shops, and dining establishment. The unit is well kept and organized and has a modern look and finely renovated. It has 3 queen beds which helped with 6 guests. Everything was in good working condition. setting yet close to all the attractions. For the price this location was ok. The photos in the listing were a bit deceiving though. The photos made the place look much larger than it really is. The location is also a bit dated and could use some freshening up. Although the villa was clean, it seemed like a lot was falling apart. The towel bar in the bathroom fell off the wall onto my wife's foot while she was just removing a towel from it. The blinds were falling off the track from the back door every time we tried to open or close them. The back door itself does not lock which I found to be a huge security risk. It is only held closed by a tin bar laid into the track on the floor. The dresser drawers would fall off the tracks every time they were opened or closed. The downstairs shower head was leaking and spraying a lot which I had to fix on my own to keep the bathroom from getting soaked. HOWEVER it was not a terrible experience. The place was clean and conveniently located to everything. It just needs a little TLC to update it. The beds were comfortable and the shower water was hot which is very important to me. We really didn't have any negative issues. For the price I received what I paid for. I would stay here again if I came back to the area, (although I would ask for the back door lock to be repaired for safety). Thanks for the review. It would have been better if you informed me of any issues you experienced during your stay. After I asked how was your check-in and wanting to make you have everything you need, you just simply replied: "Yes, thank you." I am available anytime and would have gone to the villa right away have I known the issues you wrote. Unfortunately, I did not hear from you again until you have left and just asked about the security deposit. It is very important to me that my guests are comfortable during their stay and clear and prompt communication is the key. I apologize for any inconvenience you experienced during your stay. I'll make sure to check the bathroom, towel bar, blinds, and dresser asap. Thanks again for your feedback and hope to host you again some other time. Great location! Nice views and comfy beds! We came to Orlando for a conference. It was super close to shopping, our convention, restaurants, Disney! House was comfortable and very functional for the 3 of us. If we ever make it back to Orlando, I will stay here again. One of my friends left her medication in a cabinet and didn't realize it until we were in the air. I called the owner and she agreed to send it back to her in the mail.....so nice! Clean, roomy condo close to all attractions. 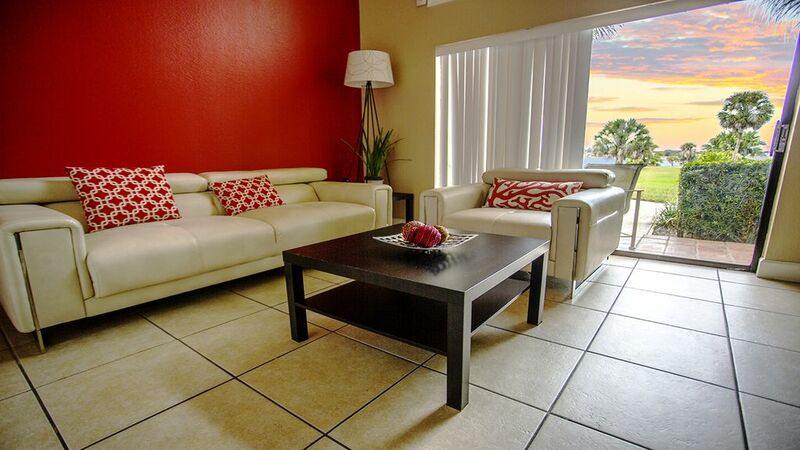 Condo was as described, complete with all furnishings, great for a family. 5 Minutes to Universal Studios, Sea World Discovery Cove, Orlando Convention Center, Orlando Premium Outlets and International Drive.